Players take the roles of "Combat Group Commanders," leading ad-hoc battle formations composed of multiple platoon-sized elements. Rules cover armor, infantry, artillery, combat walkers, and aerospace support forces. The "fast play" combat system is chartless. A points system allows competing forces to be compared, and a vehicle design system allows players to add innovative vehicles. Tactical. Ground scale is 1" (25mm) = 100 meters. One combat turn represents approximately 15 minutes. Each miniature represents an individual combatant. Designed for use with 1:285/1:300 scale miniatures. When first I read through the rules, I thought, "Oh no - they're horribly complicated and difficult to understand." And when I played my first game, I did make a number of mistakes. But while the rules seemed difficult when I read through them, they were very easy to learn by playing. The c3 and combat systems are quite elegant. The combat system includes factors such as the type of weapon you're using, how big it is, what the range is, how big the enemy is (and thus how easy they are to hit), your targeting abilities, the enemy armor, and (in the case of missiles and air combat) the enemy's defensive systems. Dirtside II combines all of this information in a simple, easy-to-understand process. Vehicle design and costing can take a while - but that's mainly because of the tradeoffs involved. There is no perfect vehicle. Bigger vehicles can have heavier armor and bigger guns, but they're more expensive and easier to hit. Anti-tank guns are great - unless you're facing infantry. The alternate platoon activation is quite nice, as are the morale rules. One thing to note if you're coming to DSII from a non-armored-warfare background is that you need to have a lot more terrain on the table than you would for, say, medievals. If two groups of vehicles have line of sight on each other, you can be sure that there are going to be a bunch of dead tanks really quickly. Combat is bloody and quick. I suspect that is more a function of the genre of armored combat than it is of Dirtside II, though. All in all, a great game at a good price. Messrs. Tuffley and Elliot deserve a lot of credit for this system. I have played Sci-Fi miniature battles for years. I really like Dirtside II. It is flexible, well laid out, and the system flows very nicely! Finally got to try Dirt Side II. Outstanding game. The rules look complex, but with use of the design cards play is fast and easy. The rules could be used for any thing from WWII to the future. Morale is easy and seems realistic. Probably one of the best sets for the money. I have to admit that DS2 is one damn good game. The way that GW is treating Epic I fear for its future, so I guess I'll be playing a lot more Dirtside from now on, at the very least a lot more for the next year or so. This game has a great system. Each player moves an entire unit. It moves, shoots, does everything. Then the opposing player moves an entire unit. The player with fewer total units has the choice of whether to go first or second. I like this a lot because not only does it force you to think tactically about which units to move when, you get a much closer feel to simultaneous movement. Units get two sections to their phase, movement and combat action. They can move first and then fire or fire then move. That way you can sneak up and fire on a unit before it gets a chance to move. Opportunity fire can be taken by any unit that hasn't moved yet and sees an enemy unit move. The op-firing unit then loses its phase for that turn. This is, I believe, the best system to date that anyone has come up with. Run by GeoHex, the U.S. distributor of the game. Includes a list of available products. Design your own vehicles on-line! Errata, questions and answers, and variant rules. Includes a game review, optional rules, vehicle designs, and a scenario. 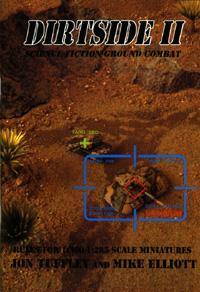 Focuses on the miniatures rules from Ground Zero Games (Full Thrust, Dirtside II, and Stargrunt II). Place "subscribe gzg-l" in the body of the message, and send it to majordomo@csua.berkeley.edu. This list is run by fans, though the GZG folks do "monitor" the list. If you know of other resources for this game, please let us know by sending email to the editor. If you have material you would like to make available to the Net, also let us know.